A double eagle, also known as an albatross, is a rare bird on the golf course - much rarer than the hole-in-one on a par 3. To make a double-eagle requires acing a par-4 hole or scoring 2 on a par-5 hole, it is a score of 3-under par on an individual hole. Consider the Odds of Making a Double Eagle and then... consider the odds of making a double eagle at 74 years old? And yet, on July 1, 2011, Mike Perez stepped onto the tee box of hole number three. The par four hole that normally plays further back, measured 247 yards on this day to accommodate ongoing fairway renovations and with one swing the 2010 Hall Of Fame Inductee put the ball in the hole. So just what are the Odds of Making a Double Eagle? Answer: Double-eagle odds are not definitively known, and different sources give different numbers. The figure of 6-million-to-1 is commonly quoted on the Web and in some print articles. The problem with this figure is that no source is given for it. A 2004 article in Golf World magazine quoted Dean Knuth, inventor of the USGA's slope rating system for golf courses and handicaps, as saying the 6-million-to-1 figure was a little too high. Knuth put the odds at 1-million-to-1. Knuth is such a smart guy, we're inclined to go with his figure. But it should be noted that Knuth's figure is a guesstimate, and that it applies to recreational golfers (the figure for teaching pros would naturally be lower). Regardless, it's clear that the double-eagle is a very rare feat on the golf course, one that Mike can be proud to add to his list of many life accomplishments. Mike Perez, a golf instructor for the Round Lake Area Park District and resident of Lake Villa IL, was inducted into the United States Golf Teachers Federation Hall of Fame during a recent ceremony in Las Vegas. In and out of a jail cell in Havana, a dining room at the Hilton, a television factory in the suburbs, Mike Perez's life journey has, for the past 15 years, sailed along on a more serene course. Perez grew up in Cuba, where his sport was baseball, he said, but the communist revolution in 1959 cut that dream short. His activities with the Knights of Columbus, a Catholic fraternal organization and vocal opponent of dictator Fidel Castro, got him arrested a few times and after the botched Bay of Pigs Invasion by the United States in 1961, he was thrown into prison. The Knights of Columbus helped him escape in 1962, and he was granted political asylum in the US. He was 26 when he arrived in Miami, alone, with no money and no possessions. He never saw his father again. He wouldn't be reunited with his mother and sister until 33 years later. "There were only a few Cubans in Miami then," recalled Perez, who was relocated to a Catholic group home for foreign students in Chicago. He found work as a bus boy at a hotel and began English lessons with a young woman of German/Norwegian descent, now his wife of 48 years. Perez found a better job with Zenith Electronics in Melrose Park and worked his way up to operations manager before retiring in 1998. He took up golf in his 30s after winning a set of clubs and now he competes each year with the USGTF and in local professional contests. 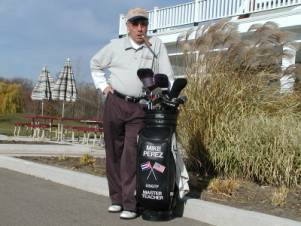 A master-level golf instructor, he has taught the game at the park districts Renwood golf course for 16 years. What's the secret to mastering the game of golf? "Patience is the key to being both a good golfer and a good teacher," Perez says. "I try to tailor my teaching to the student. The way you teach an accountant is not the same way you teach a mechanic or a doctor or an athlete. For an accountant, it's like painting by numbers, how to do each thing. For the athlete, it's a visual thing. An attorney is very analytical, wants to know all the inns and outs of the game, wants to know why the ball does this or that." Mike has conducted clinics for Boy Scouts, Girl Scouts, the YMCA, area high schools, for Spanish foreign exchange students and for Latino kids who, like him, never imagined the game of golf could be for them. "If you can get more kids interested," Perez said, "you will start breaking those barriers." Mike has been a longtime fixture at the annual United States Golf Teachers Cup, and has participated in several World Golf Teachers Cups as well. His story is a lesson in perseverance and how the human spirit cannot be extinguished. Originally from Havana, Cuba, Mike served time as a political prisoner there under Fidel Castro’s reign. After being released, he eventually made his way to Miami, and then Chicago. He worked his way up the ranks at the Zenith Electronics Corporation, retiring after holding the position of plant operations manager. Mike might have retired from Zenith, but he didn't retire from work. Earning his USGTF certification in 1995, he became a Master Teaching Professional® in 1999. He is currently the Director Of Instruction and Assistant Golf Manager of the Renwood Golf Course. He conducts all the junior clinics for the Round Lake Area Park District, and conducts clinics for the Illinois Cadillac Series. Mike has a remarkable story of perseverance. Originally from Havana, Cuba, he served time as a political prisoner under Fidel Castro’s regime, merely for being a member of the Knights of Columbus. Mike eventually made his way to Miami where he worked in the restaurant business until he relocated to the Chicago area. He joined the U.S.G.T.F. in 1995 becoming a Level IV Master Teaching Professional in 1999. Mike is also a frequent competitor in U.S.G.T.F. and W.G.T.F. events as well as local professional events. Mike conducts all Junior Golf Clinics at Renwood Golf Course in Round Lake Beach, Illinois. He also conducts clinics for several area high schools, Boy Scouts, Girl Scouts, YMCA First Tee Program, Spanish foreign-exchange students and others.